China’s new Wing Loong II UAV could potentially offer Beijing wider policy options and boost defense exports. As I reported earlier this week, China just launched its own version of the MQ-9 Reaper. The Wing Loong II was presented last month in Beijing, at the Aviation Expo China 2015, and has attracted attention due to its similarity to the Reaper. According to specifications offered by Jane’s, both are powered by a single pusher turboprop engine, place their satellite communication system and primary optical system in the nose, and employ large V-stabilisers with a smaller vertical stabiliser below the empennage. However, the Wing Loong II’s maximum operating ceiling and speed is significantly lower than the Reaper: While the MQ-9 has a maximum speed of 444 km/h and can reach a maximum altitude of 50,000 ft (15,240 m), the Wing Loong II has a maximum speed of 370 km/h and can reach an altitude of 30,000 ft (9,000 m). Furthermore, the Reaper can carry up to 3,750 pounds (1,701 kilograms) of ordinance, while the Wing Loong II can only be equipped with up to 1,050 pounds (480 kilograms). So how will China use its new UAV? One indication would be to look at its predecessor, the Wing Loong I (also known as the Chengdu Yilong “Pterodactyl I”), as well as other Chinese drones. The Wing Loong I bears a close resemblance to the U.S. MQ-1 Predator UAV and has been employed in the same sort of missions as its American counterpart. Beijing has used the Wing Loong I for reconnaissance, counter-terrorism and disaster relief in areas plagued by unrest in China itself, such as Xinjiang. Another unarmed drone, the Harbin BZK-005 has been deployed near the Diaoyu/Senkaku Islands in the East China Sea, and there are some reports indicating that there are armed PLAAF drones in the South China Sea. Some of these missions would be suitable for the Wing Loong II. Its endurance (reportedly 20 hours), service ceiling (9,000 m, 50 percent more than the Wing Loong I), and upgraded sensor could potentially make it a useful tool for Beijing in its disputed areas. As opposed to the United States, there have not yet been reports of Chinese drones being used for air-to-ground attack missions. However, as Shannon Tiezzi commented earlier this year, the increasingly sophisticated weaponry and targeting systems on Chinese drones could indicate that this might happen soon. If this were to be the case, the Wing Loong II could provide significantly more firepower than its predecessor. The official Chengdu (the company behind the Wing Loong Series) brochure picture of the Wing Loong II shows it carrying 12 air-to-ground missiles, probably the new 26.5 kg Norinco Blue Arrow. China has considered using drone strikes in the past. During the manhunt for Naw Khan, a Burmese drug lord indicted for killing 13 Chinese sailors in Myanmar in 2011, drones were extensively used to locate Khan. According to the New York Times, Beijing considered killing Khan in a drone strike, but was eventually able to capture and later execute him with the help of Thai, Burmese and Laotian police. That the Chinese government would consider using a drone strike on a foreign citizen abroad says something about its evolving stance on the use of force outside of China. One interesting fact is that PLA peacekeepers deployed to South Sudan are apparently being equipped with UAVs. No word yet on the specifics, but it is likely that this primarily includes reconnaissance platforms rather than armed drones to prevent local and international criticism. However, if PLA troops were to become involved in combat operations while on out-of-area operations, it is possible that armed drones could become a part of their arsenal. 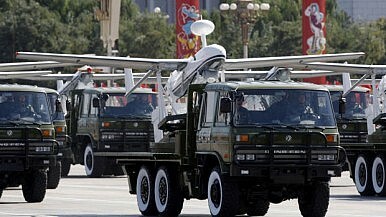 The Wing Loong I is already being used by several African and Middle Eastern states. Saudi Arabia has purchased an undisclosed amount of Pterodactyls. Other reported customers include Uzbekistan, Egypt, and the UAE. Nigeria was also revealed to have purchased Chinese drones when a Caihong-3 “Rainbow,” apparently in service against Boko Haram, crashed in the northern part of the country. The two main motivating factors for buying Chinese drones seem to be availability and price. The only other major drone-exporting state, the United States, has strict limitations on who can buy its advanced hardware. Potential buyers of U.S. drones have to fulfill strict criteria with regards to human rights and international law. This disqualifies most of the countries stated above, which forces them to buy Chinese. Furthermore, according to some sources, Chinese drones cost a fraction of their American counterparts. Although no price tag has been provided for the Wing Loong II, the Pterodactyl apparently goes for as little as $1 million. The U.S. Reaper costs around $30 million. Due to the similarities between the U.S. and Chinese platforms, there has been much speculation that much of Beijing’s drone tech comes from corporate cyber espionage. No matter where China has gotten its tech from, it’s clear that they still lag behind the United States in terms of quality. However, in our modern drone wars, quantity is a quality all in itself. What’s Behind Thailand’s New Drone Laws? A drone registration deadline this week is just one instance of a broader trend underway in the region.